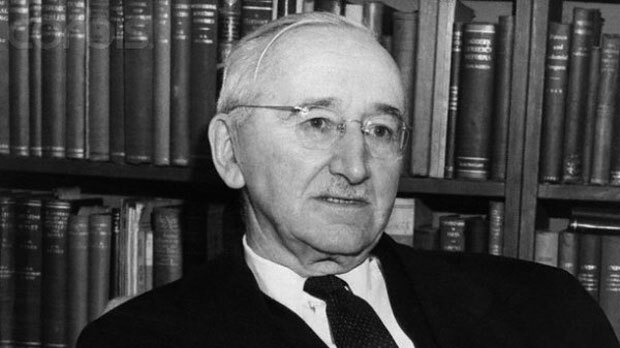 Friedrich Hayek, a renowned Austrian-British philosopher and economist, was born on May 8, 1899 as Friedrich August von Hayek, in Vienna, Austria. Hayek hailed from an affluent and noble family, his father, August von Hayek was a famous botanist and renowned physician. Hayek’s upbringing was extremely educational and scholarly, his father encouraged him to study the works of influential philosophers including Hugo de Vries and Ludwig Feuerbach. During high school, Hayek came under the influence of the lecturers he attended on Aristotle’s ethics. In 1917, he had to discontinue his studies as he was called to serve the Austro-Hungarian army at the Italian border, as a part of an artillery regiment. Following the war, Hayek devoted his time to pursue his education and to analyse the events that led to the outbreak of the WWI. Hayek was a remarkable student, he enrolled at the University of Vienna and extensively studied philosophy, psychology and economics. He earned his doctorates in law and political science. When the University of Vienna was briefly shut down, Hayek attended the Constantin von Monakow’s Institute of Brain Anatomy and spent his time Manakow’s laboratory. His explorations on brain cells and the work of Ernst Mach influenced him to make his first academic contribution, ‘The Sensory Order’, which was published later in 1952. Upon reading ‘Socialism’ by Ludwig von Mises, Hayek became very influenced by the teachings of the philosopher and began attending the private seminars of Ludwig von Mises. Ludwig soon became his mentor, and helped to promote his career. Hayek was a regular attendant at the biweekly seminar hoster by Ludwig, and he qualified for the Habilitation exam, which proved his intellectual abilities capable of being a university teacher. Friedrich Hayek was employed by the Austrian government to work as an expert on drafting the legal and economic details of the Saint Germain. He was also appointed as the director of the recently founded Austrian Institute for Business Cycle Research. In 1929, Hayek published his first book, ‘Monetary Theory and the Trade Cycle’. In 1931, he was invited to deliver four lectures on monetary economics at the prestigious institute, London School of Economics and Political Science. In England, Hayek also participated in a debate with renowned economist, Keynes, on their specific theories on the role and impacts of currency on a developed economy. Hayek has been one of Keynes most prominent critics, in his books, ‘Prices and Production’ published in 1931 and ‘The Pure Theory of Capital’, he strongly opposed Keynes models of economic thought, however, his publications did not enjoy the same popularity as Keynes’. In 1950, Hayek secured a position of professor in the Committee on Social Thought at the University of Chicago. He spent the next 12 years in Chicago, and during this period he published and wrote several works on the philosophy of science, political philosophy and economics. He published a book on political philosophy, ‘The Constitution of Liberty’ in 1960, and later, ‘The Creative Powers of a free Civilization’. In 1962, he moved to West Germany, upon accepting a position at the University of Freiburg in Breisgau. He served there for the next 8 years, until his retirement in 1968. Meanwhile, he also served as an honorary professor at the University of Salzburg, in Austria. In 1977, Hayek returned to Freiburg and finished his book, ‘Law, Legislation and Liberty’, which was a critical analysis of the redistribution of income under the farce of social justice. The book was issued in three volumes. In the 1980’s Hayek began composing his last critic of socialism, however, due to his failing health, he had to avail the assistance of philosopher William W. Bartley in editing his last work, ‘The Fatal Conceit: The Errors of Socialism’, which was published in 1988. Friedrich Hayek’s academic contributions to the fields of economics, psychology and political philosophy were awarded by a Nobel Prize in 1974. He died on March 23, 1922, in Freiburg, Germany.